Three bed home boasts private yard and lam flooring throughout main. Great Rm offers gas fireplace and sliding doors to large, south-facing deck. 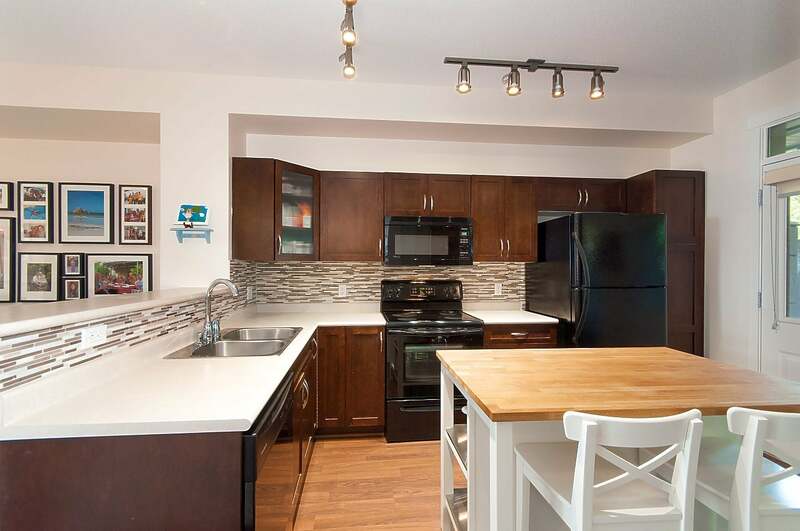 Gourmet Kitchen features rich maple cabinets, black appliances & glass tiled backslash. Walk out to back deck and enjoy grassy backyard with privacy on greenbelt. Up are three generous bedrooms and peek-a-boo island views. master is spacious and features ensuite with soaker tub. Lower level is a foyer and huge tandem garage; space for two cars plus tons of storage. Safe, family-oriented community, next to nature, near transportation and amenities. Walk to all levels of great schools including Aspenwood Elem, Eagle Mountain Middle & Heritage Woods Sec. Wonderful family home in a great complex. Don't wait!